Le Diable, made up of long, narrow fairways and a mountainous back nine, is known for its vast red-sand bunkers that give the course a nice level of difficulty. With 5 sets of tee, all levels of players are welcome. It is also the golf course that marked the career of Mike Weir, for it was here that in 1999 he won the prestigious Telus World Skins Game. This week, our professionals at Golf Le Diable share their knowledge on a challenge that has marked most players. So, here are some tips for playing in the rain. It’s no secret that golf is a sport that requires mental discipline. Remaining positive despite the rain, your game and your day will not only be more enjoyable, but likely more successful. According to Daniel Bilodeau, Head Professional Instructor at Golf Le Diable, there is a good chance that a player in your party has already lost by the first hole, simply because he or she is in a negative environment. Use this to your advantage! This point may seem obvious to some, but as in many sports the right equipment is essential. Shoes that are water resistant and a good rain coat can make your experience much more pleasant. In addition, it was recommended that we have more than one towel close at hand, to keep the hands dry on the golf club. Rain gloves are also an accessory that can give you an edge. When the ground is wet, it is expected that the ball will react differently. If you anticipate a roll of 15 to 20 feet after landing on the green, the reality might be 5 to 10 feet when playing in the rain. Especially on a course built in lengths like Le Diable, it is important to know this when planning your play. Another tip for your shot in the rain is to think about taking a different club. To get the same distance as you would have in a drier environment, a longer club will help your ball travel farther, seeing as the rain will tend to push down the ball. 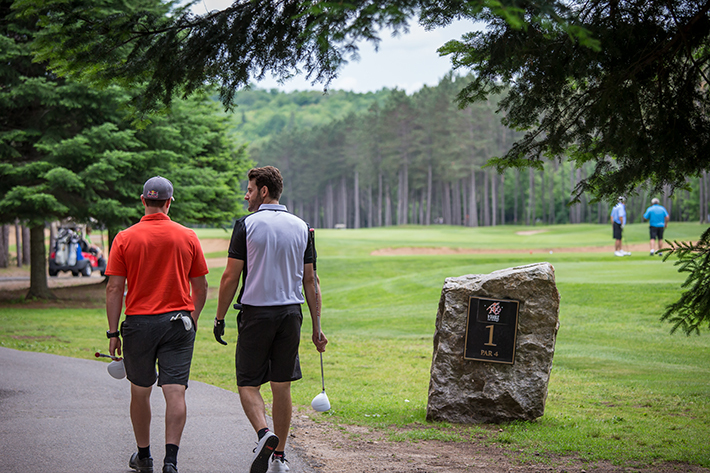 For the best advice, the Golf Academy in Tremblant is a must. A team of CPGA certified instructors provides customized individual or group lessons to improve your performance, no matter your level. In addition, it offers superior facilities, spread on 16 acres, with the best analysis software, a practice green of over 400 m2 and three sand traps with targets. The best way to improve performance is to practice, even in the rain!